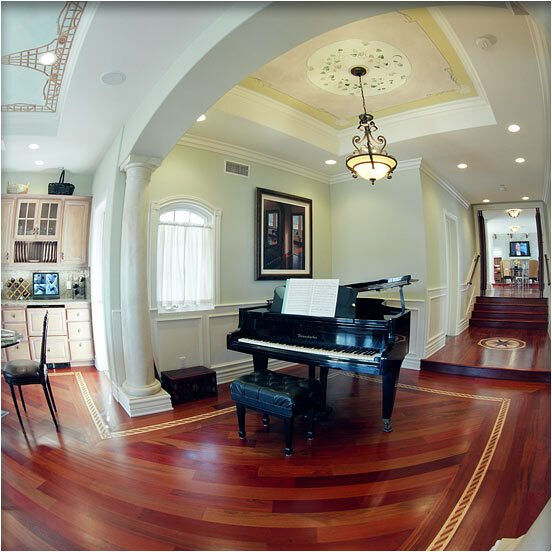 Larger Project 7-3, Music Room » Roger Perron Inc. Here is the music room, with the hand paintings we did in both this room and the kitchen partially shown. The floors are Brazilian cherry hardwood. This home has two kitchens legally, since it was once two condominiums and, after the remodel, was converted to one custom home. We designed it in such a way that it could easily be converted back to two condominiums with minimal remodeling. Architectural design for this home remodel and addition with custom floor plan in Redondo Beach designed by Antonino Bruno, architect, and Roger Perron, design-build contractor.